When it comes to harvesting wind power, the open ocean is the place to be. Some of the most powerful gusts on Earth blow over the surface of the deep sea. Unfortunately, the ocean also happens to be a really tricky spot to erect a wind turbine. One way around this is constructing wind turbines that can float, and a company is planning to build not one but five of them 15 miles off Scotland's east coast, The Guardian reports. 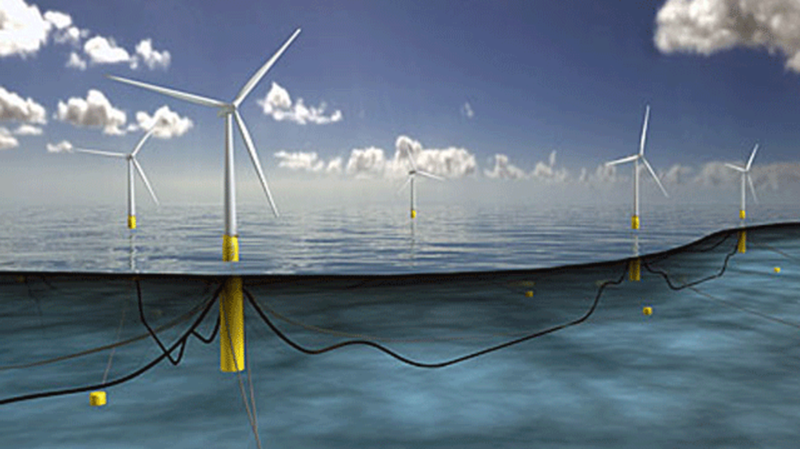 Statoil, an energy company based in Norway, has just received the seabed lease they need to construct the largest floating wind farm in the world. While most offshore wind turbines use concrete and steel foundations to stay anchored to the floor of the ocean, the 6-megawatt turbines of the Hywind wind farm will be built to bob in the water. The bottom of each structure will have a floating steel tube containing ballast for stability. A tether will connect it to the ocean floor more than 100 meters beneath the surface, which is a lot less costly than building a turbine that reaches all the way down to the seabed. A demo of Statoil's floating wind turbine has been stationed off the coast of Norway since 2010, and it's already generated more than 32.5 gigawatt hours of energy since its introduction. When the concept is implemented on a larger scale with the Hywind farm, it's expected to power about 20,000 homes.